Prescription Medication – We coordinate with your physician in supplying you with your medications. 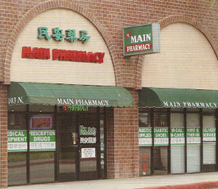 Vitamins – Main Pharmacy has a large inventory comprising of various vitamins and dietary supplements. Symptom Checker – Try our online symptom checker! Home Delivery Service – We deliver your order straight to your home.